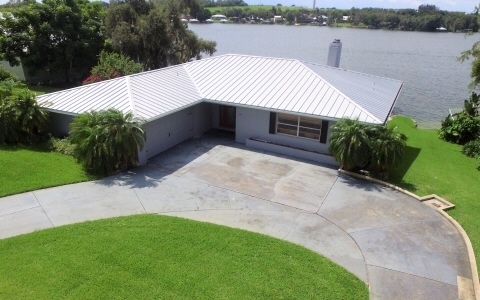 Impressively spacious and immaculately clean 2-story home located directly on the prestigious Lake June, featuring the most beautiful views the lake has to offer. The home has been converted to city water. Many new updates include freshly painted interior and exterior, new carpet installed in 2017, as well as an upgraded durable Metal roof 2009. The beautiful back yard contains a custom slate rock stairway, patio, and fire pit on the shore of the lake. Remodeled oversized dock featuring both electric boat and jet ski lifts is perfect for sufficient multiple watercraft storage. Extra kitchen in downstairs guest suite, along with a central fireplace in both the family room and master bedroom. Large, fully equipped kitchen is open to living and dining areas of the main story of the home. Fully accessible from almost every room of the home, the upstairs open deck and lower screened-in porch that face the lake are in solid, sturdy condition. Plenty of storage space in the 2 car garage with extra room. 16 Lake June RD has everything for the whole family to enjoy the ultimate Florida lakefront lifestyle!